As part of the complex land deal the City of San Jose is trying to complete in order to assemble the Diridon ballpark site, City is selling five acres of land it has already acquired to the A’s (and Lew Wolff) for $6.9 million, according to the Merc’s Tracy Seipel. Indexed for inflation, that price is only a quarter of the original purchase price and half the land’s market value. 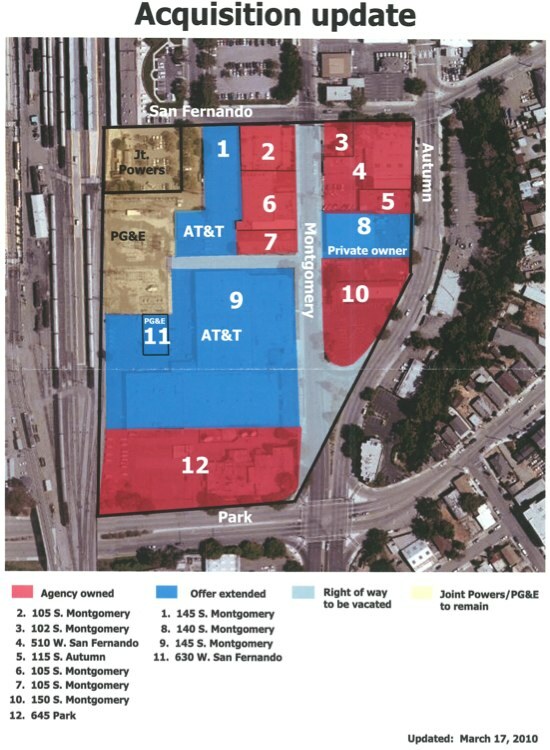 The land in question includes the former Stephens Meat plant (now a parking lot), the vacant former KNTV studios, and other properties along West San Fernando. The land sale will be voted on at the November 8 City Council meeting. The whole package would have to be voted on be the citizens of San Jose sometime within the next year. I expect City to push hard for a special election sometime in the early spring – perhaps during spring training or as the baseball season begins – instead of choosing for the 2012 June primary or November general election. Mayor Chuck Reed continues to express confidence (bravado?) in the City’s ability to finish the land deals without resorting to eminent domain. To that end, an AT&T spokesman gives a sufficiently cagey answer when asked about selling the Montgomery work center. I’ve cleared my schedule properly to cover all of this, in person for the local stuff. This entry was posted in Athletics, News, Owners, Politics, San Jose. Bookmark the permalink. It was pointed out in the article that the land is already worth less than what the city paid for it. And we’d get a $450 mill ballpark for free, 1,000 jobs and countless millions into the SJ economy. This deal is a steal for San Jose. Meanwhile, “Better Sense” San Jose still wants more empty office buildings at the site instead, to go with the 20% office vacancy rates we already have. The same folks who opposed the arena, I’ll bet. Sounds like ATT will get less $$ for the land by holding out than they’d have gotten if they’d left 3 years ago. Nice move, ATT. I think I need to move my ATT cell phone service to another company. ATT has to know the city was going to want that land for a transit hub regardless of whether the ballpark ever gets built. ML, educate me on the arrangement the Earthquakes have with SJ. Did they purchase the land, then deed it all over to the City? One might argue that even if the A’s were to deed all of the land back to SJ, the $25m is a sunk cost because SJ will never be able to do anything with the land. @fc – They kept all of the land (80 acres) except for the specific piece on which the stadium will be constructed. There’s no “surrounding” land in Diridon’s case. ML: Any way you could put some kind of graphical overlay – even if it’s just a few drawn lines – on that picture to show us how the ballpark would be positioned on the site? Looks like Montgomery Ave. becomes a pitcher’s mound…. By deeding the land back to SJ, does that mean the A’s would avoid having to pay property tax? @pjk – Sorry, no time to do that. @fc – Property tax yes, Possessory Interest Tax (a substitute) no. Seems like it’s only a matter of time now. My own guess is approval from MLB will come after the Series ends. Oh, come on, Briggs. Everyone knows you just exploited ML’s privacy settings on Facebook. Maybe we should start the donations again to send you to the owners meetings. I want answers, dammit. So much for the ridiculous claim (lie?) that the A’s are paying all of the costs for the SJ ball park. They’re paying 25% of the land’s value and that’s not a city subsidy? Give me a break. @pjk–As long as they stay in the O and don’t go to SJ, 2022 sounds fine with me. Intreresting to see all the comments on the Mercury article on this land deal. Most are not happy about it and don’t like Reed taking care of his buddy Wolff while the city is laying off cops, closing libraries, etc.. The SJ deal has always been: City provides the site, team pays for the ballpark. Nothing new there. As a matter of fact, it looks like Wolff is going to even have to pay for a chunk of the site, too, so this deal only gets even better for San Jose. @jerry- Look at other ballparks in the US. With the exception of SF and LA everyone else got free handouts from their cities and counties. Washington DC paid 611M in public money….for San Jose to sell land that was already at a major loss for a ballpark that will be free for the citizens of the city is “unheard of”. Go online and check it out, we do not live in a bubble and this is the best deal in the history of MLB for a city. Wolff got a 2 year option for 50K with another year for 25k if need be. Meaning a total of 3 years he controls the land. This all just “posturing” and I take back what I said that Wolff got the go ahead from Selig off the record. Selig will do nothing as always. The owners meetings will come and pass. With the new CBA, the Dodgers, and the Mets on Selig’s table this will not do anything. At this point I just do not think Selig will do the right thing and let this keep going. San Jose has done what it can. If San Jose was offering a free ballpark then I could see Selig acting. But privately financed stadiums do not sit well with him. He wants a handout that no one in California will give him or anyone else. I hope I am wrong….I thought Wolff was buying it outright now. @jk-usa – When someone mounts a serious recall effort for Reed, like many have for another mayor, then I can take Merc commenters seriously. Lots of positive comments on the Merc article, too. Either way, what is Oakland’s alternative? Wait 5 years for the Raiders and pray for new owners who want to build a new ballpark – that’s it. Those people on the Merc have no clue what is going on. San Jose would pass this in a landslide. 65-35 would be my prediction. No new taxes, only land, and the A’s pay for the ballpark themselves? All the city has to do is get the site ready? That is the best deal in MLB history for a municipality by far. Baseball San Jose if Selig does the right thing will open its war chest and make this happen. Better Sense San Jose will go down like Santa Clara Plays Fair did with the 49ers. It will not even be close in a vote….Santa Clara was not either. 59-41.
re: As long as they stay in the O and don’t go to SJ, 2022 sounds fine with me. …still not understanding your undying loyalty to Oakland. The team would move a whole 35 miles if the SJ ballpark is built. You could even still call them the Oakland A’s, if you want. No one will stop you. Your existing A’s cap remains current….Meanwhile, a report on the news last night had Oakland closing several schools. Oakland is in no position to throw stones at San Jose’s municipal finances given its own glass house. @ML–i don’t think Reed or Quan will get recalled. Both have thankless jobs in complex cities in these tough times.Who’s the alternative for Quan? I like Rebecca Kaplan. Does 3rd place now get the mayor’s job?..lol. @Sid–the 49ers spent $4mill, or $365 per yes vote to get the 59-41. How much is the LW/JF warchest gonna spend? SC is 1/9th SJ’s population. So will $35 mill suffice? ….Oh boy. Won’t another decade+ of bottom feeder attendance in a football stadium be just grand. Another decade of players not wanting to play for the A’s and the Giants building a giant new fan base while the A’s continue to wither away in an untenable situation. Sounds like Lew got a good deal. I just don’t think the New York teams, LA teams, and the Giants are going to be Ok with giving San Jose T-Rights to the A’s. Boston wants to protect areas of Connecticut and the Rangers and Astros won’t be excited if a team inquires about San Antonio. Do you think the Phillies, Orioles, or the Nationals want a team moving to southern Jersey? Who is that team who that will be looking for a new home? The Tampa Rays! There are not piles of teams looking to move to Connecticut, etc. There are no expansion teams planned either, that anyone is aware of. Meanwhile, the teams you mention are cutting a check to underwrite the A’s every year. Think they might like to see the A’s making money in San Jose instead of losing it in Oakland? There is no “If I vote to let the A’s move to San Jose, the Rays will move to my backyard” situation existing. Correct, GoA’s. The Giants are already becoming Yankee$ West under the current situation. Getting the A’s out of the Bay Area – which seems inevitable if San Jose doesn’t happen – brings that to full fruition. No competition within 400 miles. After months of relative inactivity or news regarding the Diridon site, and suddenly all of this. Pieces are starting to fall into place, and it makes me think that Selig, or someone in MLB, has talked confidentially with Wolff and SJ folks that the decision is in favor of A’s in SJ, so long as the pieces are in place. The “official” announcement is forth coming during or after Nov meetings. Also, Beane saying he’s awaiting decision before making moves on Willingham and Crisp and others. If he didn’t have a definitive feel, he would have moved swiftly on those guys. Let’s face it, it is in Selig’s and MLB’s best financial interest to get a new ballpark and move a team currently on the dole into profitability. They just want all the ducks in a row, and to have minimal impact on the Giants. Even the Occupy Wall St. protestors in New York have made it loud and clear which city they want the A’s to remain. @Eric 19: that’s a really lazy argument. Really, all that the owners would have to vote on re: the Bay Area is making it a shared territory consistent with the present structure of the NY, Chicago and LA markets. This avoids setting any precedent that the Rays could leverage for a move to NJ. I think each of the prospective cities you’ve mentioned already falls into another team’s territories already anyways. re: Lew Wolff getting a good deal… how often has an MLB team had to actually purchase a part of the territory where they want to build a ball park? Even if it’s below FMV, I don’t recall this happening very often and/or it’s been at an even more severely reduced price? I’m thinking Washington & Miami bent over backwards to get the Nationals and Marlins. How much collectively do the Giants, Yankees, Red Sox, Dodgers, & Angles, etc pay to the A’s in revenue sharing? These teams will still have to pay for for teams like the Kansas City Royals. A Rays move to Northern Jersey would hurt the Mets and Yankees in the pocketbook than revenue sharing. If the A’s deed all the land back to the City, aren’t they getting a free $6.9M? Or am I not understanding what ML said? And how does making Santa Clara County a shared territory translate to the Rays moving to New Jersey? I’m not following. I lived in NJ about 25 years ago when a ballpark funding vote went down in flames. Are the Rays willing to move to some place in NJ and build their own stadium while also competing with the Yankee$ and Mets who’ve been there for generations? That’s what we’d be looking at. The A’s are already established in the Bay Area. I know that the T-Rights for Chicago, New York, and LA are shared. None of those teams in those markets ever threatened to leave like the Giants did back in the 90’s. Bottomline the T-Rights are not shared in the Bay Area whether you like it or not. It is what it is and Lew Wolff bought the A’s knowing that fact. I am arguing you change the T Rights debate when you start changing the rules like Mr. Wolff wants to do. @Eric 19: Are you assuming the A’s won’t receive revenue sharing funds once they move into a new ballpark? There’s a chance that the rev sharing threshold is a crucial part to granting the A’s SJ, but that’s just my speculation. @Eric19–exactly. Lew knew about the TR’s and so did Schott when they bought the team. Lew wants to change the rules with the help of his frat buddy, but it apparently it’s not that easy no matter how many ducks he tries to line up in SJ. Jerry – Those parcels are no longer worth what the city payed for them. Wolff is not getting them at a 75% discount. He’s possibly getting a 50% discount (the article says they are estimated to be worth about $14M and he’s getting them for about $7M). But estimates are often wrong and you only really know what they’re worth when someone actually pays you for them. The city will be paid about $7M for the land. In exchange for not putting it out to open bid and possibly — I repeat possibly — getting an incremental increase in that amount paid, the city will receive a regionally important development that will attract millions to downtown businesses every single year. That is a no-brainer, zero-outlay investment for the city. Will you just stop with your lazy a$$ logic?! If you want the A’s to stay in Oakland then good for you, but argue that point rather then come up with crazy logic regarding territories and why they shouldn’t move to SJ. By the way, you do know why SJ/SC is currently the exclusive territory of the Giants, do you? Decided today not to ever venture over to SJInside again (props to Dan for that decision). I love the reality of this blog! With the exception of folk like Jerry, its good to see people actually thinking here on how good this will be for SJ. How anyone in their right mind could think this was a bad deal for SJ is beyond me. Libraries closing, police being laid off because of this?..PLEASE! By the way, OT: Quan taking a lot of flack over an Iraq war veteran being injured during the occupy protests. Oakland citizens sounding like they’ve had enough of this women. BUT THAT’S OK! she’s talked a good game about building a ballpark in Oakland, so she still has some supporters here (even if they don’t actually live in The O). Keeping the A’s out of the San Jose does not get the police hired back or expand the library hours. But getting them here brings in piles of new money into the city. Which can only help the city coffers.32,000 folks a night spending $$ in San Jose 80+ nights a year. The city needs more money and this is a way to get it. A $450 mill ballpark for free and some people are opposed? Boggles the mind. @Eric 19 – White Sox owner Jerry Reinsdorf threatened to move to Tampa Bay before Bob Lurie did. The threat worked because Reinsdorf got a publicly-subsidized New Comiskey Park. @LS – Are you asking if the City gets a free $6.9M? They aren’t, they’re getting “free” land. There’s no guarantee of that – Wolff could choose to keep all of the land privately owned. @JK – Hmmm, for a minute I thought you might be Larry Baer, because that sure sounds like what someone in the Giants organization might say. Oakland and its supporters need to quit hoping San Jose stumbles. Put together a doable plan and win on your merits. fc: Same old “If San Jose loses, Oakland wins” logic. Problem is, San Jose losing still leaves Oakland with no plan, no site and no $$ for a ballpark. perata should’ve been oakland’s mayor if not for this weird voting ballot they had last fall where perata won the vote if you just go by people who voted him “first” on the list on the ballot. regarding this article, good news that the a’s are lining up the last few hurdles before they can hopefully present something to that idiot selig and the other idiot owners showing the a’s org has everything but the green to build a new park in downtown sj. Eric – let’s apply your “logic” to equal rights for gays and lesbians. The laws say they’re second class citizens. It is what it is and they knew that when they entered into their current relationships. I’m arguing that when you start changing the laws to give them equal rights, you open the debate to people marrying animals, trees and various inanimate objects. We can’t have that. No matter though. It’s brutally obvious that you are stretching facts as far as you can in your desperate attempt to keep the team in a particular zip code. This contorting of reality always brings down the Oakland-only arguments. I sympathize. I wish Oakland had a solid, realistic vision for successfully locating a new home for the A’s. Oakland doesn’t, San Jose does and that’s the reality right now, today. re: Rays moving to NJ. They have a lease or “use agreement” that apparently binds them to their current facility in Saint Petersburg until 2027. I suppose the city might be flexible if a new ballpark was built in the Tampa area but probably not if it were built in New Jersey. The A’s lease? Up in two more seasons. ML you are right I do remember the Reinsdorf flirtations with Tampa Bay. Touche. But let’s face it San Jose, Oakland, any other place in California is not getting a publicly funded stadiums. Today I doubt Chicago would get a publicly funded stadium. Oakland has its problems but so does San Jose. For the record I do live in Oakland and not a fan of Quan. She likes to blame the police for her lack of leadership. Also I do know tha Haas gave the gave up the A’s shared T Rights to the Giants. Finally Tony D. you are pretty thinned skinned. You would think I was talking about your sister. I am just saying the Giants own your city when it comes to MLB’s territory. Get mad at the Giants and Wally Hass. Don’t get all bent out of shape at me or jk-usa. Like Sid I don’t think Selig will do anything regarding the A’s this year. One it messes with the sacred t rights issue and two he has his hands full with the Dodgers and Mets. Throw in the sale of the Astros. Maybe Lew will get frustrated and sell to someone who has a vision for the A’s and the constraints that go with them. That is what I would like to see. …and Wolff and the city of San Jose are endeavoring to correct this mistake. You don’t want it corrected but i’m still waiting to hear your plan on how a new ballpark gets built in Oakland when there is no site and no private or public dollars available for such a project. And no, an act of charity by Wolff and Fischer is not going to happen so don’t mention that non-plan. Ah yes, it happens every now and then: some newbie comes into this forum rehashing old, ridiculous arguments that were debunked long ago. The classic bringing milk into a bar! Sorry Eric, no milk allowed in this bar. As someone who’s been posting here for nearly 7 years, you need to educate yourself and read over every single thread of ML’s regarding MLB territories and their history. Before you start this arduous task, let me help you out: MLB can do whatever the hell it wants (its called the anti-trust exemption), Giants hold SJ Hostage for one reason and one reason only, all other two-team markets are shared territories, and Oakland hasn’t did squat for the A’s. Recommend not posting again Eric until you’ve educated yourself fully on this matter. Happy reading and good day to yah! If Wolff buys the land that the City owns for $6.9M, and then if he gives the land back to them, don’t they end up with the land and the cash? For the 1000th time, I would like to see them put up for sale, and lets see if some locals bite. I think they will. Portland? Nope. Just lost their minor league team for soccer. Vegas? Nope. Crappy economy, transient population, gambling in the mix won”t work. Charlotte? Hmm, not bad. San Antonio? Possibly, the best one yet..
El Paso?..lol. Way too small. Might as well throw in Fresno and Bakersfield while you’re at it!! Let’s see: How great the A’s doing in Oakland right now, JK? 30th out of 30 in attendance and players refusing to play there. I’ll bet one or more of the cities I mentioned could do a better job, especially if they throw in some public money for a ballpark, which Oakland won’t do. re: Portland? Nope. Just lost their minor league team for soccer. …That’s like saying Frisco is not viable for Major League Baseball because the San Francisco Spiders hockey team only lasted one season at the Cow Palace. @TonyD—jeez, why do you have to treat a newbie (Eric19) like that on here? A little cocky there. Chill out bro, or you’ll run off more of the Oakland guys. Maybe that’s what you want. All SJ guys, all the time. I’ve made a pledge a few weeks ago not to slam posters and to be respectful. Please do the same. @Tony D. Shame on you for using what happened on Tuesday to push your SJ agenda. @LS – Yes, but it just ends up being less of a sunk cost. Chances are that the $6.9 million and additional money would have to be funneled towards Autumn Parkway. I’ll never understand why Anon, Tony D. & pjk continue to bully the crazy pro-Oaklanders. They’re crazy. We all get it. It’s obvious to everyone why there isn’t a side plan from the City of Oakland regarding the A’s– It’s because there isn’t one. But it doesn’t mean they can’t hold out hope for their city/cause. Continually slapping down their comments is just going after low hanging fruit. Bullying turns an academic discussion with a few ignorable sideline hecklers into a mean-spirited shouting match. And gosh, if you are gonna be mean, at least be creative and funny with your tone. I swear, nothing but dad sass from you guys (That’s stuff your dad says when he thinks he’s being clever but really, he isn’t). To be fair, @ jk-usa, please stop “lol”ing. It makes my eyes hurt. Bullying? It’s just standard chat room fare. They bash San Jose and we respond by asking for viable a plan for an Oakland ballpark. But there isn’t one, as you’ve stated. Ha! I love it when the ill-informed insist on chiming in. Read over what Eric 19 posted, then come again to see if I was being a “bully.” Again, its one thing and totally understandable if you want the A’s to stay in Oakland. Its another if you spout anti-SJ bull$hit to try and bolster your case. See hecanfoos post: he nailed it! I am the one Pro-SJ guy who is more pessimistic than the rest with this whole situation. The fact Wolff got the option for 2 years with a possibility for 3 years tells you this situation will drag out longer. Selig is a grade A jerk. He has done a lot of good for baseball but this is terrible making us wait. His logic is above all else. @Jeff-athletic- I though the same thing, but with the options on this transaction that Wolff holds it shows he can purchase the land in 2-3 years. That means he is just hedging his bets with 50k-75k for the time being and the city is willing to help him. Therefore Selig could drag this out 2+ more years and Wolff will still have the options. Your right on Beane making his statements but once the owners meetings pass with no resolution then he will simply just sign what he needs for next season and that is all. Our best bet is when Selig leaves hopefully after next year as he has stated that the next guy will do the right thing. Those who keep praying T-rights will save Oakland: Giants ownership knew when they bought the team that previous ownership paid nothing for those rights and that they could be revoked at any time without compensation. You can keep saying “T-rights are sacred” like a mantra when you go to bed at night, but in the end MLB will do what it perceives to be in its big-picture economic best interest. If you’re hanging your hat on the fact that Selig uttered the phrase “T-rights are sacred” several years ago, and believe no big league Commissioners or other management figures ever distort the truth in their public statements or reverse themselves when it proves convenient, well, there’s a bridge over the Bay I’d like to sell you. In the end, economics will out, end of story full-stop. @ Eric19 A move by a team within its existing market is simply not precedent for a move by a team more than 1000 miles into a new market. @Briggs–Welcome back. Haven’t seen you on here for a long time. Okay, just because we have a difference of opinion and are hoping Oakland can pull off this stadium deal and/or new owners can take over, we’re crazy? Not cool, bro. Sorry if I LOL twice in my 7 posts on this thread. I’ll try not to LOL so much on here, but cut me some slack cuz remember, I’m a pro-Oakland crazy person..
@bartleby – that’s a lot speculation for an attorney. Correction: that would be INTELLIGENT speculation based on facts ;). Just my opinion, but you’re reading way to much into the yearly purchase options. Selig, MLB will not continue to allow the A’s to languish for 2+ years just because the Giants want to add more money to the mounds they’ve made since 2000. Repeat after me all: THE BEST INTEREST OF MAJOR LEAGUE BASEBALL! NOT JUST THE GIANTS! @ML–just looking at the map–is there a 3rd parcel–(number 11 on your map) that is owned by PG&E and needs to be acquired? @GoA’s – That extra “nub” has always been on the parcel maps as PG&E property, though they’ve never developed it. PG&E expressed a willingness to part with the piece early on, though I suspect that it’s only if the ballpark actually gets built. I had heard previously about the company also possibly selling the easement that leads to W. San Fernando as well. Maybe not. @Tony- I am with you on all your arguments. But if Selig has let them languish for 2+ years already why wouldn’t he for 2 years more? That is a good question that I think needs to be addressed. Selig will not do the right thing and why he would all of sudden change his mind when nothing has really happened in 2+ years makes me very pessimistic. I am with Bartleby that economics of the big picture should win out. But if that was the case the A’s would have been in San Jose years ago. I agree it is all about MLB and not the Giants. But Selig has made it about the Giants with his delay. Like I said before the A’s may get to San Jose, but I just do not think it will happen on Selig’s watch. Only a anti-trust lawsuit will work but with Wolff unwilling to go that route I just do not see how this works out for San Jose or Wolff himself. In any case, I am rooting for the A’s to come to the South Bay but I just do not have faith in Selig in any sense. I bet it’s because Wolff had to get the finances in order before Selig would approve the move. The circumstances around building a ballpark are much different than when Schott was able to speak to the City of Santa Clara about various plans for a park there. Poor Wash. Genaro, also add that the land situation was far from being settled. No way does Selig grant SJ to the A’s if the land or the finances aren’t there. But now we’re almost there! First off what a great game 6!!!! That is why baseball is go great. Ok San Jose boosters here is why Oakland has not put something on the table like San Jose. It is simple. Since Lew Wolff acquired the club he has said he wants to move the team out of Oakland. Maybe he tried to get something going when he was with the previous ownership group but that plan was full of holes. Secondly MLB has not come out and said we are behind the A’s staying in Oakland. In fact Selig says one of MLB’s biggest mistakes was allowing the A’s to Oakland even though the A’s have won 4 World Championships here. City Council members have publicly mentioned MLB and Lew Wolff don’t want to be in Oakland. Lew Wolff won’t even sit down with Oakland leaders and discuss possible locations. I spoke to one gentleman who is a member of the Let’s Go Oakland group and he confimed Wolff will not give the city the time of day. I really want the A’s in to stay in Oakland. I see areas all the time where I think they could build but I don’t know the ins and outs if these areas are feasible. The only other real insight I have is that a friend of mine works for the Giants. I once asked him how much would the Giants need to be compensated to give up the T rights to San Jose and we said no price would satisfy them. I will concede San Jose has their ducks in a row but mainly because of Lew Wolff’s lobbying despite San Jose being Giant land. T rights is a huge issue. If it was not, Lew Wolff would have bought this parcel a long time ago. I might be a newbie but I just want to say Marine Layer does a great job on this blog. He is the most thorough and brightest bloggers on the subject. Wolff proposed the north of the Coliseum proposal in Oakland and the city would not give him the time of day. Prior to Wolff, Mayor Jerry Brown fired the city manager for devising a downtown ballpark plan and, of course, the city and county wrecked the stadium so they could bring back the Raiders, rejecting an A’s proposal for baseball-only modifications. Tell me again who’s at fault here? ..and what is there for Wolff to discuss? The city is not going to help pay for a ballpark and feels entitled to a free one, like Frisco got. Who has to pay for it? A’s owners, of course. And if they lose a pile of $$ doing it? Not Oakland’s problem. I am pro San Jose but also believe that no decision will be made this year and may not be for the foreseeable future. If nothing changes, Lew Wolff may just get tired of it and sell the team. If he does sell the team to pro-Oakland interests, I don’t believe they will have the money to make the infrastructure improvements plus build the stadium and subsidize the losses. Ten years from now, they will still be trying to get a stadium built while they still play in the coliseum. @ PJK: how do you know the city of oakland wouldn’t give wolff the time of day? B/c Wolff said so. pretty flimsy. Besides the north of the coliseum plan was DOA before it was even announced. Entitled to a “free stadium.” No one in Oakland thinks that. We know that the City will provide the land and some infrastructure while team pays for ballpark. That was the deal MLB laid out over 2 years ago, not Oakland. MLB put that deal on the table. So stop saying we in Oakland feel like we’re “entitled to a free stadium.” Its old and worn our and factual untrue. …Oakland lacks the kind of corporate base to make a privately built stadium successful there. We know this by looking at all the empty suites at A’s and Raiders games already. Economically priced A’s suites – mostly empty. Under Oakland’s “vision,” A’s ownership bears all the risk, Oakland gets all the benefits. What a deal…And what is Oakland going to use to pay for land and infrastructure? The city doesn’t even have the money for that. In San Jose, most of that is already taken care of. Oakland hasn’t even started. On the surface these land sales look promising.But with the need for special elections and posssible eminent domain issues on other parcels still to be decided, things look a long ways off. Not to mention No MLB decision and stadium opposition. I agree with the posters that downplay the Giants- T Rights. MLB will do what is best for baseball when they decide to make a decision. Even without the T-rights issue, this situation is such a mess. I bet there has never been a more convaluted set of circumstances in the history of US Pro Sports, then what is going on here. I believe that Oakland is only concerned about keeping the Raiders, and will roll out a huge campaign to do so when that time comes. Portland is trying to build a new A short season park in the suburbs. San Antonio is trying to build a new AA ballpark downtown. Charlotte is trying to build a new AAA ballpark closer to downtown. So unless something changes on any of these fronts before ground is broken, the A’s will not be moving to these locations. Vegas , I don’t see happening. We will have to continue to wait on San Jose..